After three months exploring the incredible country of Peru from north to south, we said goodbye and crossed a dusty border outpost before driving in Copacabana, Bolivia. 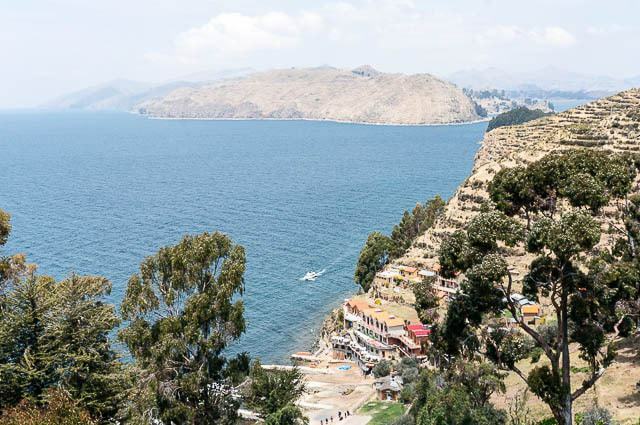 This little town sits nestled between a few hills and overlooks the humorously named Lake Titicaca, famous among every elementary school student. Copacabana is a perfect stop when traveling between Peru and the big, bustling city of La Paz, and fortunately there are quite a few things to do in Copacabana, Bolivia, and we enjoyed the few days we spent there. Lake Titicaca is a stunning, celestial blue that is so large that one might just mistake it for the ocean. 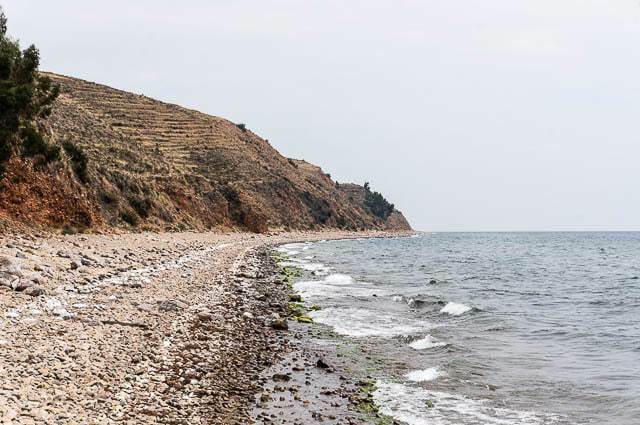 Unfortunately, this is as close to the ocean as Bolivia gets, ever since Chile stole it from them during the War of the Pacific in the late 1800s. Every year on March 23, solemn parades are held in remembrance of this terrible tragedy, a story which has repeated itself throughout Bolivia’s history as they always seem to be on the losing side of things. 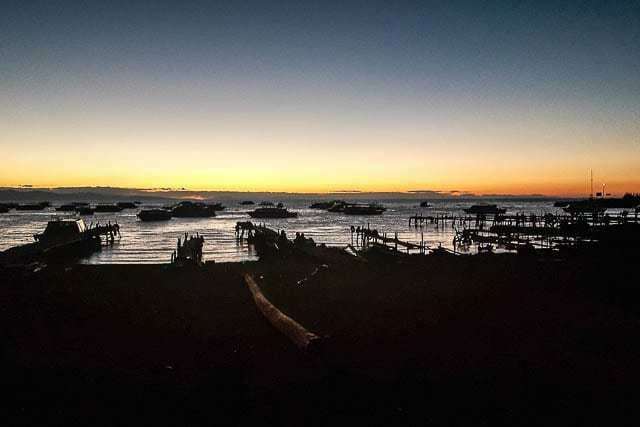 But along the lakefront in Copacabana, you can stroll along Bolivia’s Mar, eat trout along the dusty waterfront eateries, and just take in the incredible sight of the world’s highest large lake, which sits at 12,500 feet (3,800m)… It’s sure to take your breath away. Just being at the lake is incredible, but you can also go kayaking here if you like, or just soak in the sunset colors. 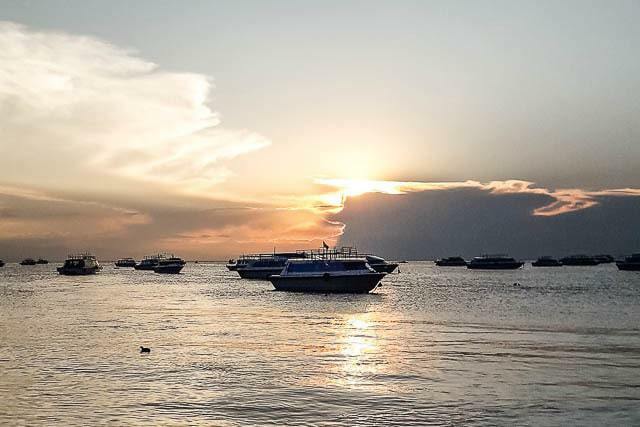 The most popular attraction from Copacabana is to pay a visit to the Sun Island which is located a two hour boat ride from town. 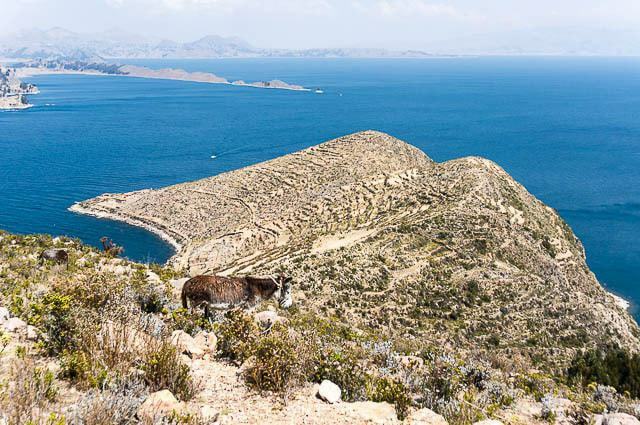 There is no motorized traffic on this island, it is a place where you can truly disconnect and step back in time as you hike along steep walkways beside donkeys and glimpse into an indigenous culture. 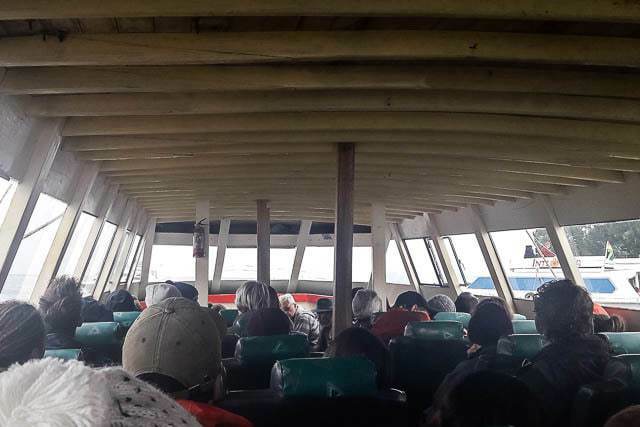 The visit to the island is absolutely worth doing, and can be done as a day trip (as we did) or stop over for a night or two. 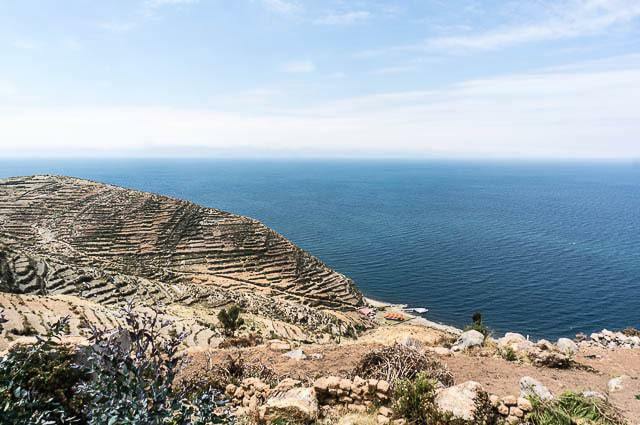 You can also include a visit to Isla de la Luna, but I would not recommend doing so if you are visiting as a day trip, because it eats up a large part of the time to get there and back, leaving limited time on Isla del Sol. Warning: If it is windy (which it often is) then the waves will be pretty horrendous and you’ll be in a small boat. 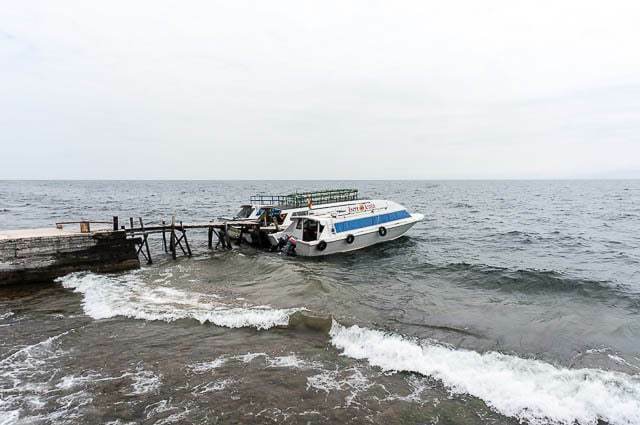 We arrived nauseous to Isla de la Luna, so much so that we did nothing except sit on the beach, only to board again for the journey back to Isla del Sol (the boat stops here first, to left off any passengers before making the round trip to Isla de la Luna). 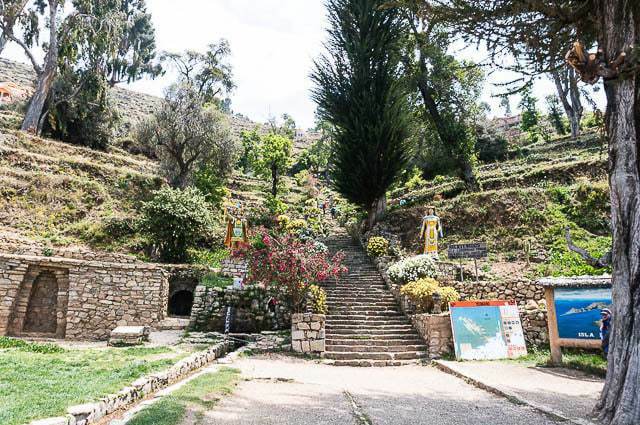 You can hike up to the top of the prominent Cerro Calvario, if you’re well acclimatized and up for the effort. Cerro Calvario is marked by the cross on top which is visible from the waterfront. Even if you’ve acclimatized, you’ll still probably be gasping for air. The Basilica sits away from the waterfront, higher up along Avenida 6. It is certainly the most elegant structure in town, and feels almost out of place in its architecture and style, a beautiful white building with ornate accents that give it almost a Moorish architecture. If you’re confined to the waterfront, you should make it a point to walk up this way to visit the Basilica and to visit the local market adjacent to town. Plus, there is no real supermarket here, so you can stock up on groceries. So, Copacabana is pretty touristy, especially along the Avenida 6 de Agosto which funnels down to the waterfront. You’ll find plenty of hawkers offering their menu on the street and promising incredible food, but we were disappointed more often than not. My rule is to avoid a place that offers everything (you know, when the menu is a book), but we fell into one of those places the first night which was a total let down. Unfortunately, the vast majority of the restaurants here are these tourist trap places with bad food. Puerto Viejo – Also perhaps known as Pueblo Viejo, this unassuming place offers a relatively set menu, but everything was prepared very well. This was the best restaurant we ate at along Avenida 6 de Agosto. 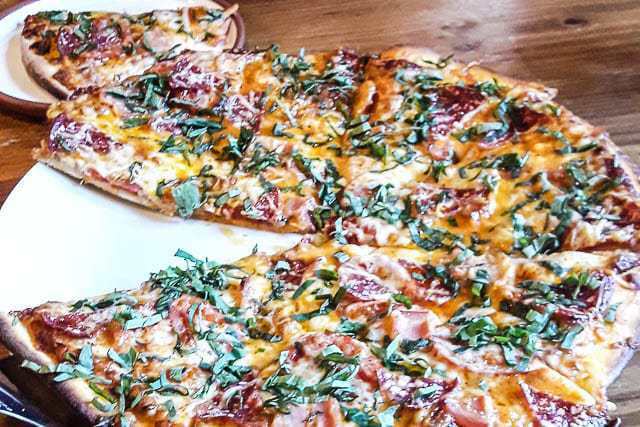 Pan America’s Picnic Basket – This place is run by a few Canadian expats, but offers really, really good pizzas. It’s hard to get into though, because it’s not always open and the schedule is somewhat erratic. We passed by a few times before we finally found it open, but the wait was worth it! Baguette About It – Delicious sandwiches on fresh bread, with things like marinated meats and excellent toppings. Perfect for a to-go lunch for Isla del Sol, or just to grab a good bite to eat. Thai Palace – This place offers Thai, Indian, and Japanese, which is immediately a red flag. But they do a pretty decent take on Asian cuisine and it’s a good value for the fixed lunch with both vegetarian and meat options available. It’s not the real deal, but it’s a good imitation for 20 to 40 Bolivianos. 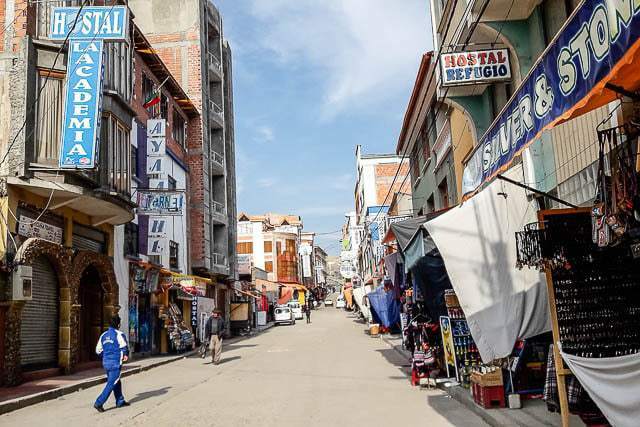 There are plenty of budget hotels throughout the city, but we found a room at the Hostel Elida near the Basilica for a shockingly cheap price of 50 Bolivianos. WiFi was super slow (but it’s like that in most parts of Bolivia) and it was clean and fine. If you’re looking for reservations, be sure to book your room on Booking.com. We spent almost a week relaxing in Copacabana after a whirlwind final couple weeks in Peru. It’s a great little town when you can look past the hawkers peddling things to tourists and the litter. 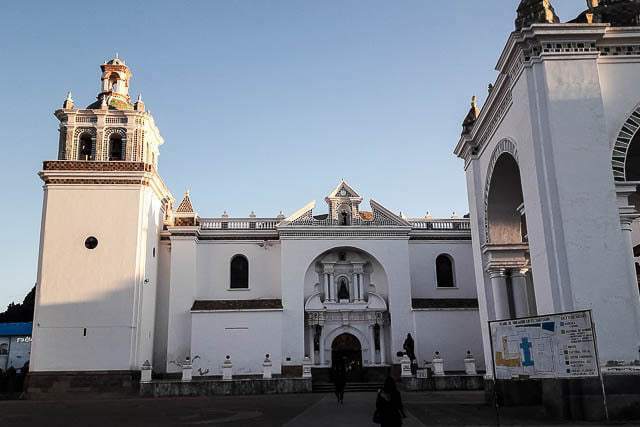 It makes a great stop to regroup either before or after Peru, and it’s a place that is worth exploring and visiting on its own. 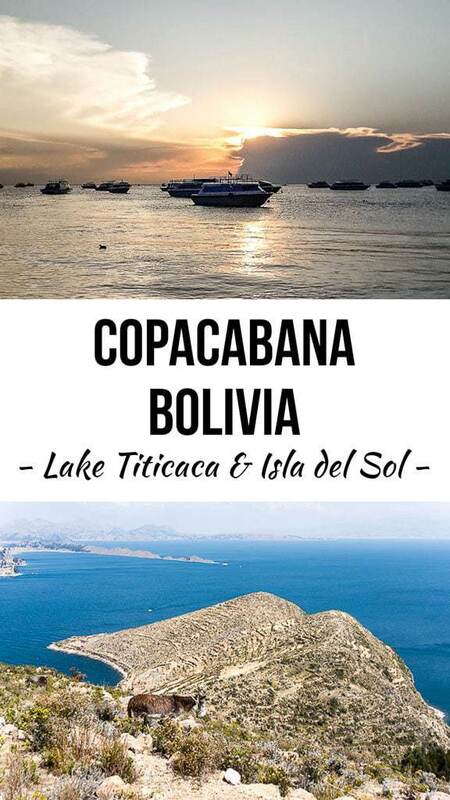 Enjoy this article about Copacabana, Bolivia? Take a moment to share it on Pinterest, Facebook, or Twitter.